Astronomers discovered the first observed interstellar asteroid in October 2017. 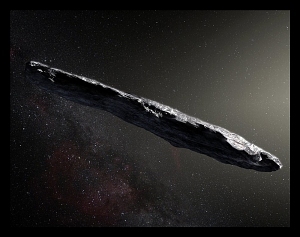 Named ‘Oumuamua in November, the asteroid is cigar-shaped with a length of almost one-quarter mile (400 meters). This concept art reveals its unusual, elongated shape, which is very unlike asteroids in our solar system. ‘Oumuamua is thought to be composed of rock and possibly metals, but not water or ice. Astronomers believe it journeyed through the region of space where the star Vega resides, traveling for hundreds of millions of years before reaching our solar system. The asteroid is moving at about 85,700 miles per hour (38.3 kilometers per second). It’s predicted to pass Jupiter’s orbit in May 2018, and then travel beyond Saturn’s orbit by January 2019. As it leaves our solar system, ‘Oumuamua will be headed toward the Pegasus constellation. Captured by Dawn, this image reveals extremely bright spots on Ceres. Located within Occator crater, the spots are believed to contain sodium carbonate, a salt, which may be evidence of a past subsurface ocean. The salts from the ocean are believed to have been carried upward through fractures in the crust and deposited on the surface. Lynnae C. Quick, a researcher at the National Air and Space Museum’s Center for Earth and Planetary Studies, believes that the salts were carried to the surface in two different ways. Flat spots may have been deposited by dissolved gas, while raised spots may have been deposited by a thick fluid. The Mars Exploration Rover Opportunity arrived at the red planet in January 2004. Looking back at the rover’s landing site, the Mars Reconnaissance Orbiter image (inset) reveals Opportunity’s lander within Mars’ Eagle Crater. Over the past 13 years, the rover has traveled over 25 miles (40 kilometers), returned more than 180,000 images and found evidence for ancient environments with liquid water. Since late 2014, Opportunity has been studying “Cape Tribulation”, an area at the southern end of Mars’ Endeavour Crater. Taken by the rover, the panoramic image reveals “Rocheport” (arrows), a ridge near “Cape Tribulation”. Scientists believe the ridge’s crest line may have been carved by water or ice or wind. In April 2017, the rover started traveling south to "Perseverance Valley." NASA/JPL-Caltech/Cornell Univ./Arizona State Univ. & NASA/JPL-Caltech/Arizona State Univ. NASA’s Cassini spacecraft began touring the Saturn system in 2004. Studying the planet and its rings and moons, the spacecraft made many exciting discoveries such as a global ocean under the icy crust of Saturn’s moon Enceladus. With a dwindling fuel supply, Cassini started its final mission, named the “Grand Finale,” on April 26, 2017. It started with 22 weekly orbits within the narrow gap between Saturn and its innermost ring. On August 14, the spacecraft then began the first of 5 passes through the planet’s atmosphere. On September 15, Cassini made a final plunge deep into the gas giant. The data collected during the Grand Finale will improve our understanding of how giant planets and planetary systems form and evolve. 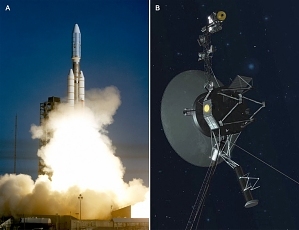 On September 5, we celebrated the 40th Anniversary of the launch of the Voyager 1 spacecraft. Voyager 1, along with its twin, Voyager 2, paved the way for many NASA missions with their investigations of the outer solar system. Voyager 1 was the first spacecraft to fly by Jupiter, Saturn, Uranus, and Neptune. It also discovered 32 moons: three at Jupiter, four at Saturn, 11 at Uranus, and five at Neptune. In 2012, it was also the first spacecraft to leave the heliosphere and enter interstellar space. As of September 5, Voyager 1 was 20.9 billion kilometers from the Sun and the spacecraft still communicates daily. A. Photograph of the launch of Voyager 1. B. Artist concept depicting one of the twin Voyager spacecraft. On August 27, 2016, NASA’s Juno spacecraft flew past Jupiter, performing its first data-collection pass. It came within about 2,600 miles (4,200 kilometers) of the gas giant and captured this never-before-seen view of Jupiter's south pole. At the pole, the planet’s thick cloud cover is peppered with rotating storms of varying sizes. These storms are similar to Earth’s hurricanes. The image is color enhanced to make it easier to see the storms. 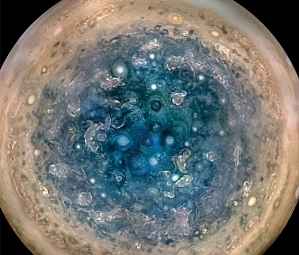 Analysis of the first data collection has also revealed similar clusters of rotating storms at the planet’s north pole, and that Jupiter’s magnetic field is surprisingly stronger than anticipated. Juno arrived at Jupiter on July 4, 2016. It will continue to study the gas giant’s origins, interior structure, deep atmosphere, and magnetosphere until February 2018. The mission’s primary goal is to improve our understanding of Jupiter’s formation and evolution. Kepler is an orbiting space telescope launched in 2009. It searches distant stars for Earth-like planets within a solar system's "habitable zone," an area around a star that maintains a temperature range moderate enough to allow liquid water to exist on a planet's surface. In 2013 two of Kepler’s four reaction wheels, which pointed the spacecraft, failed. Efforts to fix them were unsuccessful, and data collection ceased. 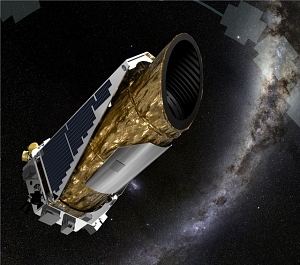 In 2014 Kepler began a new mission named K2. Using pressure from sunlight, mission scientists can control the spacecraft's position again, and its hunt for planets has resumed. On May 10, 2016, NASA announced that the Kepler mission has confirmed the existence of 1,284 new planets. This is the single largest discovery of planets to date. Mission scientists examined Kepler’s July 2015 planet candidate catalog, which contained 4,302 potential planets. They determined that 1,284 of the candidates had a greater than 99 percent probability of being a planet. New Horizons captured this image of haze over Pluto’s limb. Extending over hundreds of kilometers, the haze has about 20 layers, and is cooler and more compact than expected. On March 21, 2016, NASA revealed a new Mars Gravity Map. It was created using data from NASA's Deep Space Network and the following spacecraft: Mars Global Surveyor, Mars Odyssey, and Mars Reconnaissance Orbiter. On this color-coded map, white indicates higher-gravity areas and blue indicates lower-gravity areas. The data has enabled researchers to look inside the planet and has confirmed that Mars has a liquid outer core of molten rock. 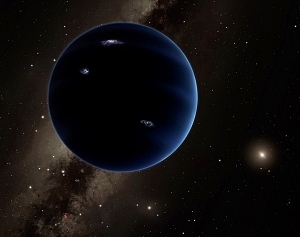 Researchers at Caltech discovered evidence suggesting there may be a "Planet X" residing deep in the solar system. Nicknamed "Planet Nine," this hypothetical planet would be about the size of Neptune and have a mass about 10 times that of Earth. They also believe it would have a highly elongated orbit and would take from 10,000 to 20,000 Earth years to make one full orbit around the Sun. This is an artist concept showing what Planet X may look like. 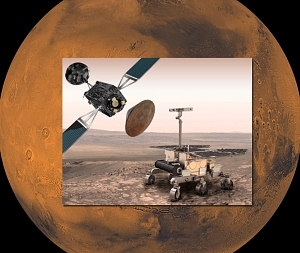 The European Space Agency’s ExoMars program will investigate the Martian environment and test new technologies. The program involves two missions. The first mission, which launched on March 14, consists of the Trace Gas Orbiter and an entry, descent, and landing demonstrator module named Schiaparelli. The orbiter will detect and study atmospheric trace gases. Schiaparelli has sensors that will evaluate its performance as it descends, and others that will study the environment at its landing site. The spacecraft will reach Mars in October and begin five years of scientific studies in December 2017. The second mission features a rover and is planned for launch in 2018. The artist concept shows all three elements of the ExoMars program. InSight (Interior Exploration using Seismic Investigations, Geodesy and Heat Transport) is a NASA Mars mission consisting of a single lander. It will use sophisticated geophysical instruments to investigate the red planet’s interior. The data collected by InSight may help scientists understand how the terrestrial planets formed. 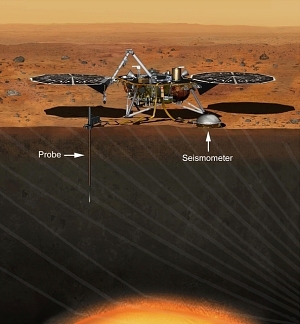 The artist concept shows the lander with its heat-flow probe and seismometer. The probe, contributed by the German Aerospace Center (DLR), is designed to hammer itself 3 to 5 meters (about 16 feet) deep in order to monitor heat from the planet's interior. The seismometer, contributed by the French space agency Centre National d'Etudes Spatiales (CNES), will measure distant marsquakes while providing detailed information about the planet’s interior structure. Scheduled for March 2016, the mission launch date was postponed due to issues with the seismometer. It will be at least two years (2018) before the next available launch window because of the relative positions of the planets. 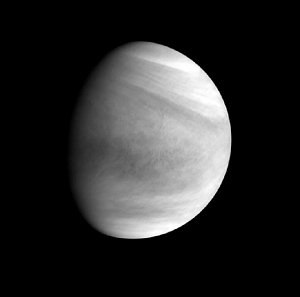 The Akatsuki spacecraft, also known as the Venus Climate Orbiter (VCO), captured this image of Venus on December 6, 2015. Launched by the Japan Aerospace Exploration Agency (JAXA) in May 2010, the spacecraft arrived at Venus seven months later. It failed to enter orbit when a faulty valve in the fuel pressure system malfunctioned, which in turn affected the engine firing schedule. VCO flew by the planet and circled the Sun for five years before JAXA was finally able to place it into an alternative elliptical Venusian orbit on December 7, 2015. Carrying a suite of six instruments, the spacecraft will study the dynamics of the planet’s atmosphere from orbit. It will also measure atmospheric temperatures and look for evidence of volcanic activity and lightning. 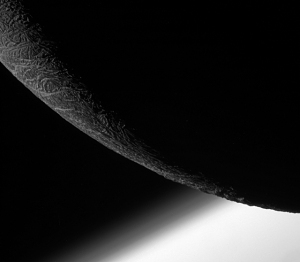 On December 19, 2015, the Cassini spacecraft captured this image during its final close flyby of Saturn’s icy moon Enceladus. Taken about 24,000 kilometers (15,000 miles) from the moon's surface, it also reveals the layered atmosphere of Saturn beyond. Launched in 1997, Cassini began orbiting Saturn in 2004. It completed its initial four-year mission in 2008 and its first extended mission in 2010. The spacecraft remains in orbit, continuing to study the planet and its rings and moons on its second extended mission. 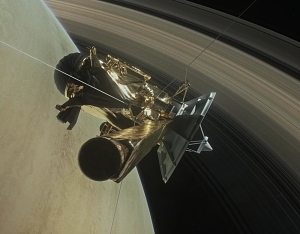 In late 2016, Cassini will begin an exciting set of orbits called the Grand Finale. During these orbits, it will collect data on Saturn’s gravitational and magnetic fields, ring mass, atmosphere, and ionosphere. It will also acquire the last views of Enceladus. On December 18, 2015, the Curiosity rover captured this view of Mars’ Namib Dune. This dark-sand dune is 5 meters (16 feet) high and 7 meters (23 feet) from the camera. The dune is part of the Bagnold Dune Field on the northwestern flank of Mount Sharp. The mountain (arrow) is visible in the background. 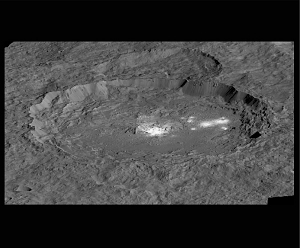 NASA’s Dawn spacecraft captured these close-ups of Occator, a crater on the dwarf planet Ceres. About 90 kilometers (60 miles) across, it contains the brightest spots on the dwarf planet. Scientists believe the spots contain salts, specifically a magnesium sulfate called hexahydrite. Launched in 2007, Dawn arrived at Ceres in March 2015. About 940 kilometers (584 miles) wide, Ceres is the largest object in the asteroid belt between Mars and Jupiter. It’s believed to have a rocky core and a thick icy mantle. The best available images taken during New Horizons’ flyby of the Pluto system were combined to create these unique views of Pluto (left) and its largest Moon Charon (right). Using images taken of every side (except the south pole), these views reveal what a full rotation of the dwarf planet and moon would look like. 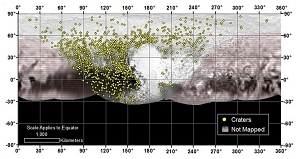 The New Horizons team located more than 1,000 craters on this map of Pluto. Scientists count the number of impact craters to determine the age of a surface. Older regions generally have more impact craters. Pluto’s oldest regions are about 4 billion years old. Its youngest areas may have formed within the past 10 million years. On October 31, 2015, Asteroid 2015 TB145 flew within 480,000 kilometers (300,000 miles) of Earth. 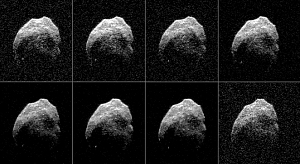 This series of radar images was taken of the 1,300-foot (400-meter) wide asteroid before its closest approach. This is the closest known flyby of Earth by an object this large. The radar images were created using the Deep Space Network antenna in California and the Green Bank telescope in West Virginia. The Deep Space Network antenna beamed a radar signal at the asteroid, and the Green Bank telescope received the reflection. On August 14, 2015, the Mars Exploration Rover Opportunity captured this image of Hinners Point, an outcrop at the northern edge of Marathon Valley. The rover has been investigating the valley since July. It became an important site after the Mars Reconnaissance Orbiter discovered clay minerals, called smectites, there. Like all clay minerals, smectites were once formed in the presence of water. The solar-powered rover has spent every previous winter standing still in one sunny spot, conserving energy. During this, its seventh Martian winter, Opportunity will be able to remain mobile. For several months starting in mid- to late October, the rover will operate on the southern side of Marathon Valley to take advantage of the Sun-facing slope. The shortest-daylight period will come in January 2016. The Mars Reconnaissance Orbiter's high-resolution imager HiRISE captured this image of a scarp (cliff) at the edge of the red planet’s north polar layered deposits. This feature is the site of the most frequent frost avalanches on Mars. The small white cloud (arrow) is likely carbon dioxide frost dislodged from above and in free fall. The Curiosity rover captured this view of the higher regions of Mount Sharp on September 9, 2015. Ridges packed with hematite, an iron oxide, exist alongside plains rich in clay minerals and rounded buttes containing sulfate minerals. 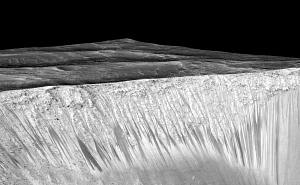 Deposited billions of years ago, these water-related minerals suggest a changing environment on early Mars. Mission scientists hope to explore these diverse areas with the Curiosity rover in the months and years ahead. To scale, this family portrait shows the four largest bodies in the Pluto system. The portrait is composed of individual images taken by the New Horizons spacecraft. Evidence for Liquid Water on Mars Today! The Mars Reconnaissance Orbiter (MRO) captured this image of dark narrow streaks on the walls of Garni crater. Called recurring slope lineae, these streaks are believed to be formed by the flow of briny or salty liquid water on present-day Mars. On September 28, 2015, NASA announced the possible connection between these features and flowing water on the red planet. Using an imaging spectrometer on MRO, scientists found hydrated minerals, called perchlorates, in the streaks. These water-related minerals could lower the freezing point of a liquid brine, allowing it to exist within the shallow Martian subsurface. The streaks also seem to change over time, darkening and appearing to flow down slopes in warm seasons, and then fading away in cooler seasons. The Rosetta spacecraft captured this image of comet 67P/Churyumov-Gerasimenko (67P/C-G) when it intercepted the comet in August 2014. 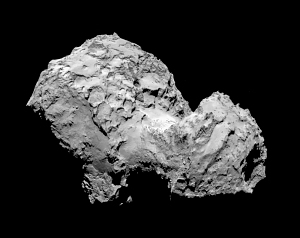 On September 28, 2015, Rosetta scientists announced that 67P/C-G is actually two comets that collided at low speed, which would explain its distinctive double-lobed shape. They made this discovery using high-resolution images to study the layers of material surrounding the comet’s nucleus. Launched in 2004, Rosetta completed a 10-year journey to the outer solar system where it intercepted 67P/C-G. The spacecraft will stay in orbit around the comet until the end of 2015, studying it closely and mapping its surface. Rosetta is an international mission led by the European Space Agency with support from NASA. Taken by the Lunar Reconnaissance Orbiter Camera (LROC), this image reveals a lobate scarp (arrows) on the Moon’s surface. 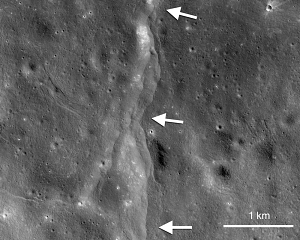 Scientists believe these small scarps or cliffs form as the lunar interior cools, causing the Moon to shrink and the crust to break. The terrain on one side is pushed upward, forming a fault scarp. Scientists using LROC imagery have discovered thousands of young lobate scarps. They are usually less than 10 kilometers (6 miles) long and only tens of meters high. According to Thomas Watters, a scientist with the National Air and Space Museum’s Center for Earth and Planetary Studies, tidal forces caused by Earth’s gravitational pull have influenced the alignment of the faults. Watters is lead author of the paper describing this research published in the October 2015 issue of the journal Geology.